The MustHD 7-inch on-camera Field Monitor M701 is designed to help photographers or film makers to get better focus and thus better pictures and videos with video camera! The MustHD 7-inch on-camera video-assist field monitor for video camera presents crystal clear image of what you are shooting directly onto a large 1280*800 LCD screen, meaning you never have to fatigue your eyes to see any image again. Ideal for armatures as well as professionals who need to view images all day long! Make focusing, framing your picture and previewing quicker and clearer. Place the 7 inch monitor for your video camera at varied angles without worrying about keeping your eyes level with the miniature in-built camera screen. 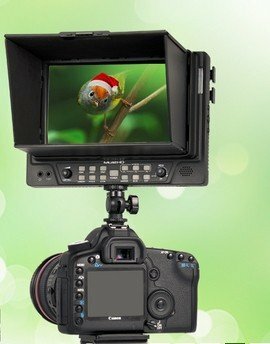 What makes the MustHD 7-inch on-camera video-assist field monitor for video camera better than other similar products in the market are largely from its excellent menu design; custom preset button, knob-control mechanism, unique sun-hood and battery plate. Users can scroll up and down easily to view the menu confirmation, customize regularly-used function to 6 buttons. Users can install/uninstall, open/close the sun-hood easily, so are the battery plate. This video camera monitor comes with a hot shoe mount and a handy HDMI cable so that you can simply take it out of the box, plug it in and away you go! Producing a fine and clear picture with a bright and full color display! Even when used in the sunlight this video camera monitor is easy to view, using the sun-hood of unique design (which features easy install/uninstall, open/close). It can get power source by the attachable battery plate or DC-power adaptor (supplied). Two years warranty. If you have any questions about this product by Mus-Tech, contact us by completing and submitting the form below. If you are looking for a specif part number, please include it with your message.